Have You Ever Seen An Orange Juice Flavor Sky? From the back of the car Emily shouts to the sunset - Look! The sky is orange juice flavour! Today’s adult blog spotlight is on Orange Juice Flavour Sky. This blog is written by Emily’s dad, Paul, and if you weren’t clued in by the extra u, they share their story from across the pond. Rotherham and South Yorkshire area where folks call Trisomy 21 Down’s syndrome. I love reading about Emily’s family and their adventures. What you should do, right now, is drop everything, put the kettle on, and spend a few hours reading everything from the blog that shares: “Lessons I'm learning from Emily and others with Down's syndrome.” However, if you, for some odd reason, can’t do that. I will point you to a few of my favorite posts. This post came early in my “meeting” of the family, A Date to Remember. This is the story of Emily’s first date. “So let me tell you about my daughter Emily & her boyfriend Jono. Emily is 20 and has Down’s syndrome; Jono is one year older and also has Down’s syndrome. They met at school when Emily was 16. It soon became apparent to their teachers that there was something in the air (and it wasn’t the chicken korma drifting through from the dining hall). No, Emily and Jono had hit it off. Laughing together, wanting to be with one another, being in a better mood when the other was near. Sound familiar?” You’re going to have to read on to see how this one turns out. Here on The Road we love to share stores about adults who find their creativity! Allie has done just that! She's also the first (alphabetically) on our list of adults who have their own businesses! 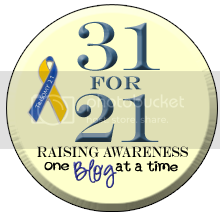 Today's post was written by Allie and her Dad and on Friday we get to talk to Allie on our BlogTalk Radio show! Be sure to join us and welcome Allie and her family to The Road! Check out Allie's website and Facebook page.